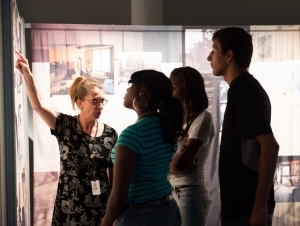 A First Niagara Foundation grant will provide K-12 school groups from throughout the region with free guided tours of the Burchfield Penney Art Center at Buffalo State for the 2016–2017 academic year. “If I’ve learned anything in nearly 40 years as an educator, it’s that nothing is as powerful as the joy of discovery—and truly, nothing is more effective than the arts to make this happen,” said Mary Marino Kozub, Burchfield Penney manager of education. “When a student is guided to first look and encouraged to imagine, remember, and make connections, they begin to understand and really comprehend. Suddenly all of those higher-order thinking skills that educators are endlessly working towards are engaged,” continued Kozub. “Nowhere on earth can this happen as easily as in a museum…as every work of art is a riddle, and every riddle has a number of solutions." Teachers can book tours by contacting Kozub directly at (716) 878-3156. Groups of all sizes can be accommodated on a first-come, first-served basis. Hands-on art making workshops can also be added to a tour by request. All tours based on availability.